This is one of those trite family films that preaches the power of belief and asserts that everyone is unique and special. It's standard fare for an unthinking diversion designed to satiate the status quo: impress the rug rats with bright colours, kinetic camerawork and silly archetypical characters and don't give them anything to think about that'll question their future commitment to the commerce machine. After all, as depicted in Rise of the Guardians, Earth's greatest champions are the avatars of holiday spending given action hero makeovers. Santa Claus (Alec Baldwin) leads the pack, here inexplicably cast as a Russian tough guy with prison tattoos who's quite handy with a pair of cutlasses. The Easter Bunny (Hugh Jackman, permitted to use his native Australian accent for a change) is a tall, wiry, boomerang-wielding warrior rabbit. Being the lone female in the club, the Tooth Fairy (Isla Fisher) is treated as less of a physical threat; she's essential a giant, flaky hummingbird that teaches kids the value of entitlement with her teeth-for-coins enterprise — if the natural order of things is observed, you deserve to be compensated. 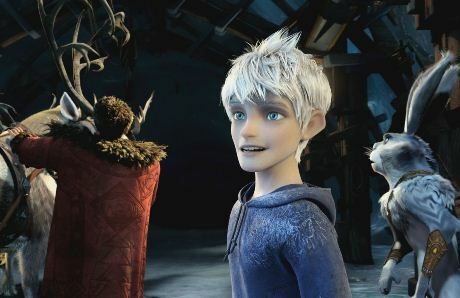 The typical hero's journey that drives this buoyant propaganda follows Jack Frost (a bland Chris Pine) as he tries to find his purpose. An outsider that nobody strictly believes in, as he lacks a holiday, though they often feel his mischievous influence, Jack is chosen by the Man in the Moon (the last light in the darkness, omnipotent, moves in mysterious ways — an obvious representation of God) to become a new guardian. Pitch Black (a sneering, pompous Jude Law), aka the bogeyman, has risen to subvert the beliefs of children, poisoning their dreams with nightmares and sabotaging the hopeful myths the guardians uphold.